AutoIt-Recorder is a tool written in C++ on. Autoit-Recorder is a tool written in C++ on.NET for windows. It aids the Autoit (seperate project)developer in creating test Scripts. These test Scripts can be fed into the Autoit tools to help the automation and testing of windows applications. Unfortunately, many users have some issues when installing this utility on their PCs. Mouse Tamer allows you to record everything your mouse does with a single click and play it back as many times as you like. For precise control of your mouse, you can create and save your own scripts step-by-step. Facilitates software distribution and configuration over networks. It is controlled by an easy-to-learn script language that resembles DOS batch command scripts and BASIC. 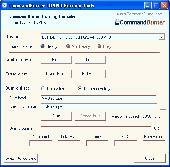 Its features include INI-file and registry processingcommands and the unique ability to synchronize completedirectory trees. RSU32 supports UNC (United NamingConvention) and Remote Registry Manipulation. Fully featured shareware, no missing functionality. PhpDock is a Web Server and Web Browser combined in one, small executable, capable of both running PHP scripts and rendering resulting HTML in the application Window. All you need to do is place PHP scripts in the document root directory of PhpDock. ScriptAhead helps you automate your daily tasks by writing automation scripts for you. Especially useful for Windows administrators, lets you compose scripts that manage every aspect of a Windows computer/network through an easy to use interface. This is script is disabled - I will do custom RSS scrape scripts for you. If your city has a 'gasbuddy. com' site similar to HamiltonGasPrices. com, then this script is an excellent way to take part in the gas war. CommandBurner is a free CD/DVD burning software utility that can be executed from the command line, as well as through a simple interface, making it suitable for integration with programs, scripts and batch files. .